Following four sessions of sizeable losses in value, precious metals climbed along with crude oil this morning as a vote on the implementation of required austerity measures neared in Greece. Prime Minister Papandreou’s proposed 78 billion euro program of spending cuts and asset sales faces a tough sell but is the prerequisite to the release of some 12 billion euros in payments coming from the initially approved bailout package. As well, a rolling over of Greek debt will be needed in order to secure the next payment tranche to Greece, but that deal is not anticipated to materialize until Sunday, at the earliest. Thus, when one adds the anti-austerity strikes having been staged this morning by Greece’s communist-led trade union to the equation, there is enough uncertainty surrounding the issue to account for the small rebound in precious metals even as the US dollar gained additional ground. Spot dealings in New York this morning opened on a firmer note across the metals’ complex as the aforementioned Greek drama prompted a recovery in crude oil and a bit of an optimism-driven bounce in the euro. Still, physical demand at under the $1,500 mark was rather tepid according to dealing desks we contacted overnight. Apparently, there are some clusters of bullion orders on the books near $1,480.00 by Indian traders who are taking a wait-and-hope approach to the recent sell off in the yellow metal. Spot gold was quoted at $1,501.50 at opening time in New York, showing a $4.50 per ounce gain. The first hour of trading did not offer much in the way of follow-through buying however, and gold struggled to maintain the $1,500 level as did silver the $34.00 one. Speaking of physical metals, we note the revamping of one (much-visited by investors) website that focuses on the world of gold bullion bars. We are of course referring museum-quality and highly educational www.goldbarsworldwide.com website, which, with significant support from the World Gold Council, now boasts a home page that is much easier to navigate, and has a more contemporary format. Along with the redesign, two new supplements have also been placed on the GBWW website. One of the site’s updates is highlighting the bars produced by Meskuk & Ziynet — minted by Turkish State Mint. It may come as a surprise to most retail gold investors to learn that The Turkish State Mint has issued 134 million "Meskuk and Ziynet" gold bullion coins (13 million ounces equals about 405 metric tonnes), making them the world’s best-selling gold bullion coins over past decade. The coins were sold mainly in Turkey and in the Middle East. The United States Mint, by comparison, issued only 9.8 million Eagle and Buffalo gold bullion coins (6.8 million oz’s. = 212 tonnes) in the same period. Silver had actually started Tuesday’s session at $33.99 with a 41-cent climb but thus far remained within the 75-cent range we saw overnight (from $33.50 to $34.25). 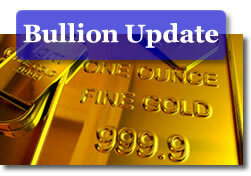 Platinum picked up $19.00 per ounce to open at $1,693.00 the ounce, while palladium rose $9 to the $735.00 mark. No price change was reported in rhodium which was indicated at the $1,925.00 per ounce level on the bid-side. The on-again/off-again Saab saga added another chapter this morning with the news this morning that the Swedish car maker might actually meet payroll on account of a deal to sell 28 million euros’ worth of property and a 13 million euro order by an unnamed Chinese firm on Monday. The beleaguered automaker’s vehicle production remains suspended however. Like that of Greece’s, Saab’s plan "B" for survival appears to morph with each passing day. Despite assertions made this morning by one EU official that a "plan B" for Greece does not exist, the markets see little more but a "plan B" in the [French] proposal to extend the repayment terms on Greece’s debt for perhaps as long as 30 years. French and German bankers evidently anticipate that the Greek Parliament might succumb to popular pressure against higher taxes and lower spending and need an alternative to a plain old default. The Financial Times noted that in the eyes of said bankers, "plan B’ (as in: buy time) is not the same as "plan D" (de facto default). One financial website has now likened the Greek debt market to the US hosing mortgage one; it is both "risky and unpredictable." Wait; isn’t that the best definition we already have of… most markets? Speaking of risks overt and hidden, there is at least one school of thought (that of the North American Securities Administrators Association) that warns that ETFs pose hidden or overlooked downside risks to investors who are all too eager to jump into them with their cash. Among such less-than-commonly-considered dangers, the NASAA singles out the structure of so-called "inverse" ETFs (bearish ones) and leveraged ETFs aimed at buyers willing to augment their bullish bets. The daily adjustments of such vehicles results in holders incurring larger piles of taxable gains. As well, the NASAA warns that, albeit being less costly than mutual funds, ETFs often come with fees that are overlooked by buyers and that trading such instruments with a high degree of frequency piles up commission costs in a hurry. Finally, with the advent of thousands of such funds, the NASAA cautions that some of them will not live to see the light of day of next year, the next decade, etc. Up to the present time, the risk of an ETF closure has been minimal (only one has folded in 2011 and only six more have announced coming closures). In any case, the best advice is to read, read, read (the prospectus) before you buy, buy, buy. Well, someone must be at least buying, buying… US homes, that is. Case-Shiller reported the first monthly rise in US home prices in eight months this morning. Dwelling price tags rose in 13 out of 20 cities being tracked by the firm across the USA. The 20-city price aggregate climbed 0.7% in April. The news helped the Dow futures gain some 50 points in pre-opening action. On Tuesday, the Dow managed to close above the 12K mark. Albeit the Case-Shiller findings are not corner-turning results just yet, there is hope among realtors that such a day might come not too soon in the US market.